"That will include making sure any bid would be financially viable and would help economic growth in the State. If SA is serious about economic benefits they should look at what I said previously and target events that would be relevant today or in the next few years. The Commonwealth Games are on their way out as a money earner, have limited global interest and are not required as a marketing tool. "As one of the most livable and safest cities in the world, which already has some of the infrastructure foundations in place like the new Adelaide Oval, Adelaide would be a strong applicant to host the Games. But first we need to ask the right questions and make sure we are satisfied with the answers." Sure, the livable and safest cities is good, that's undeniable, and can be used in any ad campaign to attract people and events here. The infrastructure is another issue with good and bad. Our Swim Centre is of a high level as the Entertainment Centre for indoor sports, but I don't see the Adelaide Oval as being remotely world class. It is basically best suited to AFL and Cricket, and even then not as good as Telstra Stadium, The Gabba or even Etihad Stadium. I may be wrong, since some field events such as athletics can be close to the perimeter, but anything in the centre or far-side of the ground viewed from the low-angled lower level will be hard to distinguish. Prepare your binoculars I say. Other infrastructure like transport would have to be dealt with too. I guess at this point we should have a (light)rail link to the airport at minimum and maybe one of the TODs as accommodation for the international athletes. But I would rather see these up-and-running even without the Games. Just a thought. SA is the only mainland state yet to host a Commonwealth Games. Adelaide was beaten by Kuala Lumpur to stage the 1998 Games, and in 2008 the Rann Labor Government withdrew from the race for the 2018 event, citing budget pressures. At the time then-Treasurer Kevin Foley branded the Commonwealth Games a "B-grade event". Love or hate Kevin Foley, he made the right decision. I truly think that we should look at spending our hard earned cash on smaller regional (Asian) and global events, and more of them spread over the year(s) than one event. I really think we need to focus on Asian events which get our neighbours over to enjoy Adelaide, rather than some British legacy item. All fine but I am not really a fan of government funded sports, entertainment or for that matter casino led recoveries. Much rather see every spare government $ go into medical, manufacturing technology, universities, mining, ports, roads and other infrastructure. Dog wrote: All fine but I am not really a fan of government funded sports, entertainment or for that matter casino led recoveries. Much rather see every spare government $ go into medical, manufacturing technology, universities, mining, ports, roads and other infrastructure. Agree. Inbound tourism is an essential focus for our economy. Additional direct flights from Asia should provide the impetus and the incentive to target the rising middle classes and more adventurous younger generation from China, India etc. I'm sure these are an increasingly important target market for our Tourism Commission and Tourism and Hospitality operators. Our reputation for high quality wine is an important asset as the Chinese market increases in affluence and sophistication and this segment could be targeted with holiday packages combining a level of indulgence. There is a definite need for more high quality accommodation in the wine regions. Building on our reputation as an education hub, safe, liveable and more affordable option for higher education students, especially from Asia, is important. Parents visit offspring and students spread the word about their experience in Oz and our city/state. The increasing development and centralization of many higher education facilities in the city and attractive student accommodation, with minimal transport costs, facilitates the appeal of our education hub. The new medical, research, health precinct and allied University courses add an extra dimension. Proximity of accommodation to our fabulous Central Market is an added bonus. The international students add to the vibe and cosmopolitan feel of the city. In my opinion, the increased University presence in the city and the tram extension have been major factors in adding to the vibe and appeal of the city. Free travel on the tram within the city is a massive factor for tourists and students getting around the city and is great for locals. I would rather see dollars spent on extending the tram (loop?) even further to add to the liveability and appeal of our city than on a Commonwealth Games bid. The tram has a re-generational effect on parts of the city and would be great for tourism. The tram attracts more users to public transport than buses, connects up many of our businesses, hotels and attractions and adds to increased pedestrianization of certain precincts. An increased tram system would have spinoffs in tourism, education and benefits for locals. Examples: The tram could be a major factor in extending the number of visitor days in our city. Other benefits are dealt with in the Tram thread of this forum. Yes, it would be nice to see rejuvenation and development of sporting facilities for a CG, an accommodation village and other assets but could we justify the cost for a one off event which appears to be losing relevance and has to compete with a plethora of world and regional sporting events - for athletes, attendees, sponsor dollars and TV rights - in an increasingly crowded sports calendar! My view is no. However, why can't we look at our city with fresh eyes with an influx of visitors from more and more diverse regions? Eg Improved signage would benefit all, mobile apps taking advantage of our extensive free WiFi, in many language options (eg for walking tours, facilities) and more tree plantings/street furniture/improved streetscapes and adding to our excellent laneways program. It should not take the prospect of a CG or other world event to add further improvements or innovations to add to the appeal of our city. SPORTING facilities worth around $200 million, including a 10,000 seat indoor venue, a netball stadium and a new South Australian Institute of Sport will all have to be built if Adelaide decides to bid for the 2030 Commonwealth Games. An audit by the Office of Recreation and Sport has determined the gaps in the sporting landscape that would have to be filled to bring the state’s facilities up to standard to host a Games. Sport Minister Leon Bignell said the report showed how affordable it would be for Adelaide to host the Commonwealth Games. “We looked at and thought you could probably get away with all of that stuff in there and even build it very well for about $200 million,’’ he said. for the new indoor sport facility that is required. “The outcome can range from do nothing...to the rolled-gold multi-sport facility that costs $60 million.’’ he said. “That could be a great venue for tennis, but you could use it for big-time netball games, big time basketball games and concerts. The report was presented this week to the Commonwealth Games feasibility committee which includes Mr Bignell, businessman Rob Gerard, Liberal leader Steven Marshall, Peter Smith, chief executive of the Adelaide City Council, Ish Davies, regional director of News Corp SA, which publishes The Advertiser, and Olympic gold medallist Juliet Haslam. A decision on whether Adelaide will bid for the Games is expected to be taken in the middle of the year. Department of Recreation and Sport chief executive Paul Anderson said $40 million would be required to construct a new South Australian Sports Institute and the preferred site at Santos Stadium. The previous federal Labor government had committed $20 million to the project but the incoming Liberal government declined to match the funds. Mr Anderson said his department would now seek the funding from the state government. An Adelaide Commonwealth Games would use existing facilities such as the Entertainment Centre and the Festival Centre for events, while venues such as the Marion Aquatic Centre, the Velodrome, the Pines Hockey Centre and Hindmarsh Stadium would need to be upgraded in some way. The Adelaide Oval would be used as the main athletics’ venue and for the opening and closing ceremonies. The estimated $200 million bill to hold the Games in Adelaide does not include the cost of building a village to cater for the 6500 athletes and officials in town for the event. However, the Gold Coast, which is holding the 2018 Games, is spending around $640 million on its village. Mr Bignell has previously flagged using the site of the Women’s and Children’s Hospital, which will be vacant by 2030, as the village but said it would be a “money-making venture’’ as the apartments would be sold to the public after the Games had finished. HOSTING the 2030 Commonwealth Games would leave a positive and lasting legacy on Adelaide, Olympic hurdles champion Sally Pearson says. Pearson lives on the Gold Coast and said she’s seen first hand the infrastructure benefits for the city as it prepares to host the Games in 2018. She said Adelaide would enjoy similar benefits, helping it transform into a modern sporting city. “It’s been great for the Gold Coast,’’ she said. The Gold Coast will spend about $2 billion to host the Games, including close to $1 billion on capital investments and infrastructure such as a new tram network.. The Games are expected to generate about $2 billion in economic benefits. “We’ve needed this type of investment in the Gold Coast for a very long time and I think the Commonwealth Games are going to fast-track that and help the city as it grows. Pearson said she couldn’t wait to compete in her home city in 2018. Although I would like to see Adelaide host the Commonwealth games i think Australia as a whole has had enough of them for a while. Give another country a chance to host them. I'm pretty sure South Africa for example have never hosted them. It seems that there's a tradition that there's usually 12 years between Commonwealth Games being hosted in Australia and New Zealand. [Shuz] wrote: It seems that there's a tradition that there's usually 12 years between Commonwealth Games being hosted in Australia and New Zealand. There's a tradition, but it's a tradition that they're trying to get away from! There's a general agreement that more Commonwealth Games should be held in developing countries, though few bid as hosting them is expensive. Anyway, the 2030 host won't be decided for another 9 years - is there any point in planning the bid now? The Commonwealth Games are so passe! Why? Go read my previous posts and you'll know what I mean. As for 2030, why wait until then? That's too far ahead. How about we start planning for the short/mid-term with strategic events that would involve some of the world's major players? Events where we would generate genuine publicity for Adelaide and SA! Both Labor and Liberal should get their act together on this one. Seriously. Don't let Melbourne or any other state capital take away opportunities to boost tourism! P.S. Many years ago I worked as a sports photojournalist covering events for overseas agencies (mainly European). So in my humble way I can say that I know a little about how events can publicise a city. I remember when we had the Hockey Champions Trophy. I was working for a Dutch agency. In that tournament The Netherlands reached the final (losing to their perennial enemy Germany). The Netherlands had many fans, some were here specifically for the event while others were backpackers. My agent in Holland also wanted images that showed the country or city their athletes were in. Not the stereotypical image with a kangaroo for example. We got publicity here in various ways, TV, in person, in newspapers and probably on the internet as well. Huge events are not required to attract good publicity. Targeting the right country and audience is. COOPERS Stadium would become Adelaide’s first covered stadium and its capacity increased to 25,000 spectators under an ambitious $75million plan linking it with the upgraded Adelaide Oval to land the Commonwealth Games. Both rugby codes also would be enticed to the enclosed, weatherproof stadium in the plan to cement Adelaide as a sports mecca. Stadium managers Adelaide Entertainment Corporation (AEC) is investigating an option of using a lightweight transparent roof - of similar fabric used in Beijing’s Water Cube - to protect spectators from the elements. TELL US: Should Coopers Stadium be covered? The upgraded, covered stadium would be pivotal to government plans to bid for the Commonwealth Games. While a government investment would be needed for the roof, AEC sees the stadium as a future profit maker. AEC runs the neighboring Adelaide Entertainment Centre at a profit, with no call on taxpayer subsidies, and already has plugged the ongoing money drain of Coopers Stadium under Government management into plans for a profit by the end of 2014-15. The proposed ETFE (ethylene tetrafluroe) roof being investigated is the same material used on the large dome at the front of the Adelaide Entertainment Centre. AEC executives says the facility is becoming outdated and the State Government will need to decide if it is to remain South Australia’s home of rectangular sports and so redevelop the facility, or look to build a new stadium on a new site. 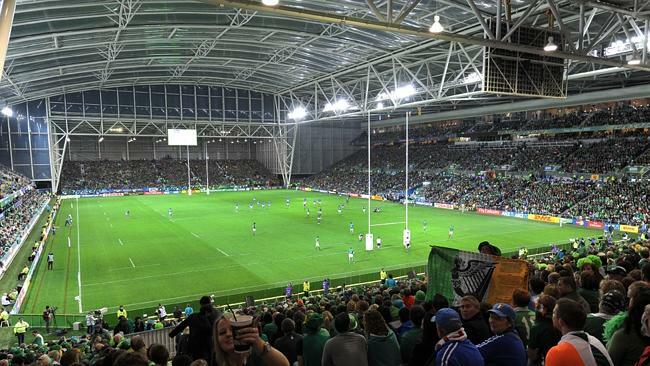 They now are investigating the merits of increasing shade protection for fans, enlarging the pitch by 7m to attract rugby codes and increasing capacity from its present 17,000 up to 25,000. One option is installing veranda roofs over the grandstands, increasing the size of one of the existing grandstands and building additional seating in the vacant corners of the stadium. The more ambitious option is to enclose the stadium with a lightweight roof. AEC chief executive Anthony Kirchner stressed the investigations are at a very early stage, with no firm costings and no plan yet put to the State Government. “We are looking at a whole range of concepts but this is very much in its infancy,” he said. Mr Kirchner recently visited Dunedin at the request of the AEC board to examine the Forsyth Barr Stadium, which has a ETFE roof. The stadium’s roof collects water to irrigate the pitch comprised of real grass strengthened by synthetic grass fibres. The lightweight roof has gaps at the top to allow air flow and the stadium is generally about 3-4C warmer than the outside temperature. Mr Kirchner said while the Dunedin roof was 100 per cent transparent, an Adelaide roof may be 50 per cent transparent to reflect heat and would need careful design to ensure player and spectator comfort in summer. AEC estimates an ETFE roof would cost around $45 million, with another $30 million needed for seating capacity improvements. If no upgrades go ahead, it estimates the cost of a brand new 25,000 seat rectangular stadium to be in excess of $250 million. 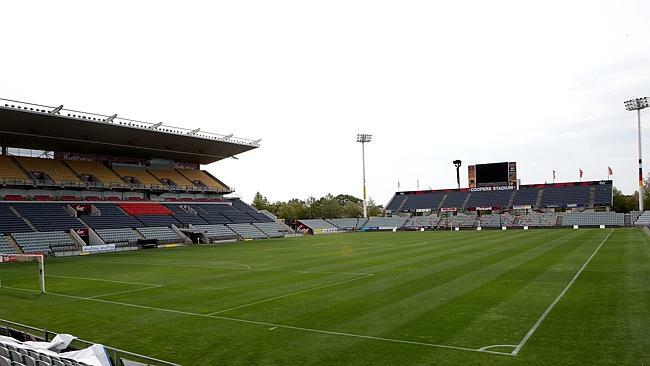 Since taking over management of the stadium from the State Government in July, AEC has slashed the regular $500,000 a year loss to an expected $250,000 this financial year and expects to be profitable by the end of 2014-15. It has signed Coopers as major naming rights sponsor for five years and the $4 million it is investing comes from profits from the Adelaide Entertainment Centre rather than from taxpayers. These improvements include new seats, more food and beverage outlets, new lift, new dressing rooms and general maintenance. Adelaide United is the ground’s core tenant and their hiring agreement is ‘widely regarded as the best stadium deal of any A-League franchise’ according to a report by consultants KPMG into the stadium arrangements. AEC is taking a conservative approach to Adelaide United’s hiring fees but says the current arrangements are not commercially sustainable. The option of covering Coopers Stadium may depend on Adelaide’s proposed bid for the Commonwealth Games and its success in enticing other professional sports. As reported by The Advertiser in November, AEC is in talks with the NRL to lure a Sydney rugby league team to Hindmarsh for up to five games a season, making Adelaide a second home in the way AFL’s Hawthorn regularly plays in Tasmania. Another proposal to waste money. Football (soccer and rugby) don't need covered stadiums. All they need is roofs to cover the fans if required. The first thing they should do at Hindmarsh is move the pitch further south so that they can fill-in the gaps in the corners. Then they can take the capacity up to 25,000. Yes, host rugby games...and yes, let them play in the wet (and mud). That's how rugby should be played. ^^ Have you sat in the outer at hindmarsh? It's woeful. One of the worst sporting experiences i've ever had was sitting in the outer northern stand a few weeks ago in the blistering sun. There is absolutely no shade over 75% or that ground's seating area. The first thing it needs is some form of shade, and by the time they mess around with retrofitting this feature to stands that clearly weren't designed with it in mind, it mightn't be much more expensive to add a completely enclosed lightweight roof. spiller wrote: ^^ Have you sat in the outer at hindmarsh? It's woeful. One of the worst sporting experiences i've ever had was sitting in the outer northern stand a few weeks ago in the blistering sun. There is absolutely no shade over 75% or that ground's seating area. The first thing it needs is some form of shade, and by the time they mess around with retrofitting this feature to stands that clearly weren't designed with it in mind, it mightn't be much more expensive to add a completely enclosed lightweight roof. You can say that about many grounds spiller. You'll get wet and sunburnt even at the new Adelaide Oval. What they should've done, back when they designed this stadium, is build a tier above the lower terraces like the new eastern stand that has been built at Perth Glory's ground. No stadium is perfect unless you build it from scratch and Hindmarsh was a patch-up job. This is a major gripe that I have with many developments in Adelaide. Most seem to be patch-up jobs or just plan simple bad and cheap designs. The other thing to consider is that most games played at Hindmarsh are twilight and evening matches. I will concede though that you'll get wet but, the organisers shouldn't be so criminal to have you sitting in 40C heat! Well it appears Adelaide will bid to host the 2026 or 2030 Commonwealth Games. It's a 'non-binding' commitment at the moment, as stated by Weatherill.